The plain vmware tag adds no value as we never get any questions about the company. When it is used it is usually used in error and in place of a product specific tag which would be more useful. This usually leads to people being asked to clarify which product they are using so that the correct answer(s) can be given. 1648 questions have the vmware or a vmware-* tag. 536 of these don't have the plain vmware tag so they are OK. Of the remaining 1112, 375 have the vmware and vmware-* tags - these could be removed easily by a dev. This leaves 737 that have a plain vmware tag. 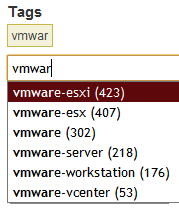 There are 461 with a plain vmware tag which mention ESX(i) in the body. All the questions with vmware have been re-tagged over the past week or so. Can we please get this tag black-listed now? If you need tags to be destroyed / removed, PLEASE have a developer do it -- otherwise you will edit-push hundreds of questions to the front page for no good reason, and add revision history that is meaningless. So, carry on, just be sure to ping us for en-masse changes like this so we can do them without disruption to the site. edit: per request, I have blacklisted the tag ^vmware$ now that it no longer exists. Well done everyone! This is tricky, because there are a ton of questions with only the vmware tag -- 1,090 as of the time I originally wrote this. That leaves ~568 questions (!) needing manual retagging. That's .. a lot. Really a lot. I was skeptical, but we did indeed make a big dent in it with these heuristics. The vmware tag went from almost 1,100 to around 300. If you guys could retag a third or so of those, to get it below vmware-server I think we might be in the clear.